Humor and laughter are universal aspects of human life: humans’ first vocalization is crying but laughter follows quickly after. During childhood we often select our friends based on their funniness, we (especially women) feel attracted by people that make us laugh and sharing a laugh is a powerful way to maintain good relationships. Humor is mainly a social phenomenon: we laugh and joke much more frequently when we are with other people than when we are alone. All cultures throughout the world present some sort of humor, even though each form may have its own differences. From an academic standpoint, the topic of humor seems to have gained over the years the reputation of being an elusive and mysterious phenomenon. Earlier researchers did not regard humor as a proper topic for scientific investigation. Nowadays there are many studies on humor in different fields. Unfortunately in managerial disciplines there are very few. 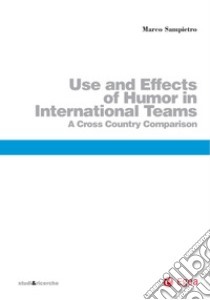 This research aims at filling some of the existing knowledge gaps by exploring the type of humor used while working in national versus multinational teams and if humor has an impact on team performance. The research compares G8 countries.